On Tuesday, during An Undefeated Conversation with The President Obama: Sports, Race and Achievement at North Carolina A&T State University in Greensboro, North Carolina, the 44th president tackled a broad spectrum of topics, ranging from his political career to the athletes who inspired him. Compared with the several times I’ve seen President Barack Obama talk in previous forums, this one stood out far more because he provided a message that made an impact on me: never being defeated. It was one thing for him to embed this throughout the conversation when discussing platforms of protest or his efforts post-presidency. But the setting and the audience was what made everything special. North Carolina A&T is one of the most recognized historically black colleges and universities (HBCUs) with a proud tradition and history, and Tuesday night was a shining moment for all HBCUs. I could only imagine how this moment will inspire current students’ journey toward graduation. But this conversation was also important for HBCU graduates like me, who continue to work hard to succeed. There’s an undefeated spirit that comes with being an HBCU graduate, the same spirit that Obama believed was the idea of overcoming obstacles “after getting knocked down in life.” You graduate from a school that provides an experience that empowers you through culture and tradition, but once you walk across that stage, you don’t really know what to expect in your journey. It’s not easy to succeed right after getting a degree, but it makes things more difficult when you’ve come out of an HBCU that lacks the resources and knowledge that a lot of powerful predominantly white institutions (PWIs) have, not to mention the stereotypes that are applied to HBCUs. It’s a struggle that I’ve experienced many times, occasionally making me feel defeated when things don’t go my way, but I continue to make things better for future alumni. This was a struggle that the president identified in Tuesday night’s conversation, but what made it so powerful was how the defeats in his political career related to the struggle we face. Every HBCU graduate’s journey doesn’t revolve around a spot in Congress. It could have been a job that we didn’t get or an opportunity we completely missed out on. Failure has no limits, but everyone can learn from the mistakes they’ve made in order to progress, and that helps us to achieve and continue our journey. Obama’s remarks were a perfect segue to his opinions about the removal of vanity after defeat, and how realizing what your journey represents can push you to succeed even more. “When you start having that attitude that something is bigger than me, then your individual victories or defeats become less important than the broader project,” he said. This spoke volumes to me, because as a former student at Morgan State University, my journey and many others’ will impact the state of our school, as well as the current students’ future. Being an alumnus of an HBCU, I represent an institution that battles for prominence in academia as much as its alumni progresses professionally. My progress matters. Our progress matters. It’s not just about the “notable alumni” section on Wikipedia. There’s a responsibility to push forward in order to make it better for the next generations who walk on that campus. It motivates me. It should motivate you to keep working hard. 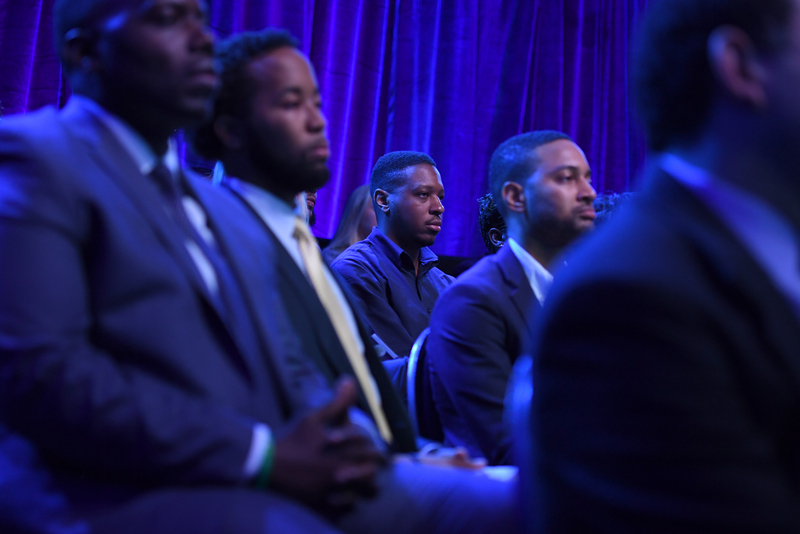 Audience members watch as ESPN’s Stan Verrett and President Barack Obama talk during ESPNÕs The Undefeated: A Conversation with The President: Sports, Race and Achievement at the Alumni-Foundation Event Center on the campus of North Carolina A&T on October 11, 2016 in Greensboro, N.C. This statement is important to graduates like me because it relates to what we can do to develop HBCUs. It’s obvious that a lot of our schools struggle to thrive compared with PWIs, but this is an issue that graduates can help solve by finding their own ways to continue to develop these schools. Yes, we may be in the process of developing our own careers, but there’s a responsibility that we have as alumni to help push our alma maters forward. It doesn’t have to be through money (it could be, though), but just doing simple things such as talking to prospective students about your positive experiences could help change the stereotypes of HBCUs and inspire students to remain undefeated. This conversation was a step forward for HBCUs, spotlighting the influence of tradition and history at universities such as North Carolina A&T, while also noting the status of black colleges and their relevance to our country’s history. This shouldn’t be where the conversation stops for alumni or students. An Undefeated Conversation with The President has shown me that, as a graduate, my journey as an alumnus is as important as the students’, because we all have a role we play in the development of black colleges. There’s only 107 HBCUs in this country, and many continue to struggle even as others are thriving. However, unlike many institutions of higher learning, HBCUs expose students to an experience that could never be imitated, and it builds both a family within that school as well as a connection with other HBCUs. They are national treasures, and we as graduates must do what we can to preserve their treasure, whether it’s through our achievements or failures on the stages to our success. It’s the only way that — even with our issues, history, traditions, strengths and potential — HBCUs can remain undefeated.